Behaviour change, merging the fields of sociology and psychology, is becoming an increasingly important area of research and action. Simply put, household sustainability behaviour change projects aim for a target group to take up more sustainable behaviours. The complexity of behaviour change lies in the difficulties in changing behaviours, as opposed to raising awareness for change. 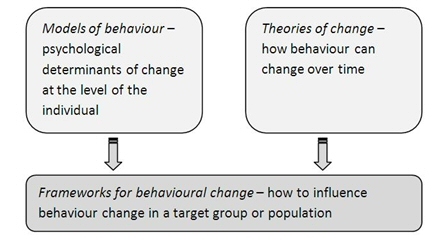 There is extensive literature on behaviour change, with the British Government Social Research Unit providing a thorough review in their Reference Report: An overview of behaviour change models and their uses. Theories of change. Explain how behaviour can be changed over time. Frameworks for change. Built around models and theories (see figure below) and provide a practical approach to designing and implementing interventions (eg. Community Based Social Marketing). The effectiveness of behaviour change using a social marketing approach that targets “small steps” behaviour has come under some criticism for its failure to lead to the societal-level change required to confront the perils of climate change. The ‘voluntary’ nature of behaviour change programs means that monitoring and evaluation of their outcome is paramount in order to gauge their success or failure, capture learnings in order to improve programs, and to determine the return on investment in such projects. A main tenet of the critique relates to the potential for a rebound effect, or Jevons paradox. This is important to recognise in project evaluations in order to understand both the intended and unintended outcomes of a project.